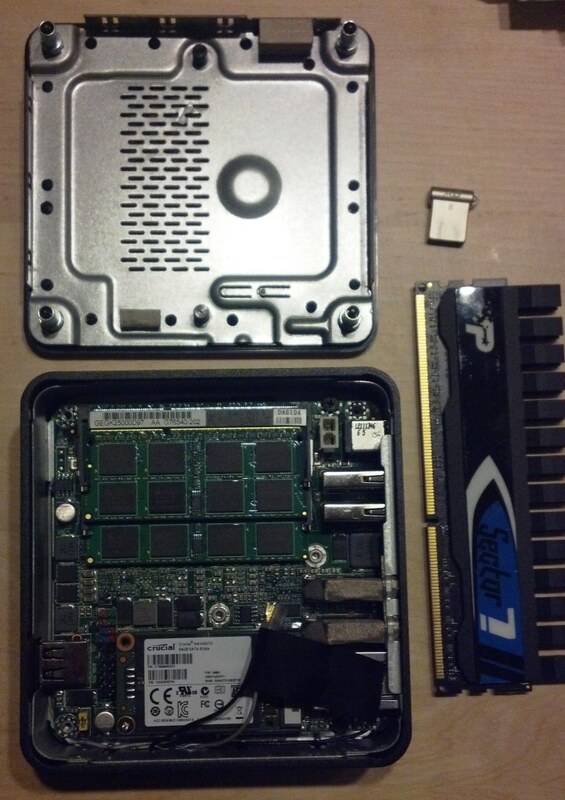 This entry was posted in Hardware Adventures, Home Lab, Virtualization and tagged esxi, esxi5, home lab, msata, nuc by rsts11. Bookmark the permalink. Have you tried (or know someone who has tried) using the Celeron NUCs instead of the Core i3 NUCs? I’m thinking of building a lab with a bunch of virtual appliances acting as virtual network devices (switches, routers, etc) as well as very low traffic internal web servers, so I don’t think I’ll really need the horsepower, and figure I can have a mix of NUCs later. Just want to make sure the Celeron NUCs are compatible before dropping down money on NUCs, USB keys for boot drives, and 16GB memory for each.. I do not, although I met a vendor recently who is using the Celerons for other purposes. I may get around to trying one, or maybe someone else will comment here on the matter. 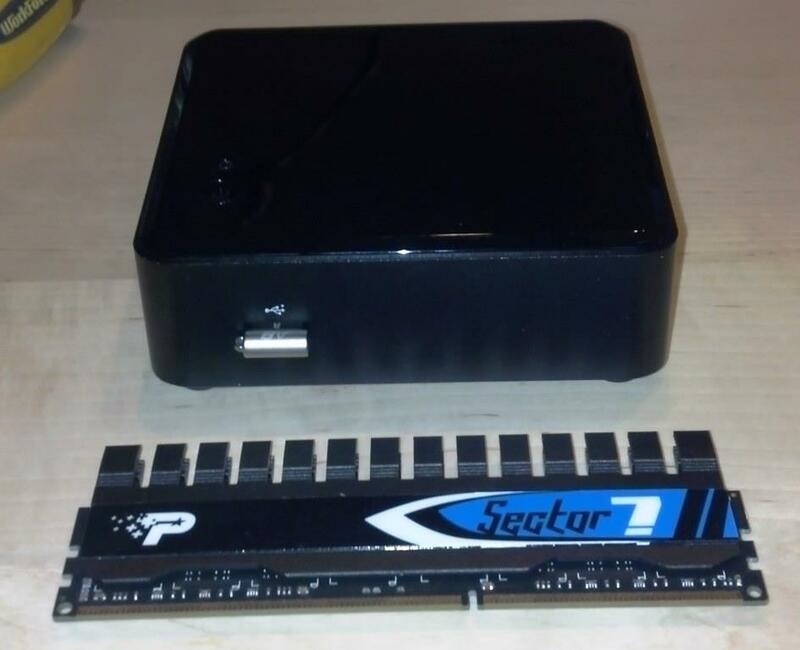 I am also considering using a Celeron version for a tiny ESXI. Obviously I don’t expect awesome performances, but this is a cheap way to have a fanless Intel based hypervisor. If anyone has tried it please let me know ! Be aware that the new i5 NUC is apparently announced, and while it may hit the market at a higher price point ($400ish? ), it might also push the prices on the lower machines down. For those of you looking for the higher end… according to http://www.intel.com/content/www/us/en/motherboards/desktop-motherboards/desktop-kit-dc53427hye.html the i5 NUC has a fan, but it also has USB3, Mini-displayport, and support for 32GB of RAM. Thanks for the information. I’m not interested in a fan-cooled solution, but as you spotted it, it could could make the actual Celeron and i3 versions cheaper. However, a reseller in my country has a discount certainly more interesting than the *possible* Intel price drop. Did you tried the Celeron version yet ? I haven’t gotten a Celeron unit yet… pondering it, but I may have a bigger lab project that pushes me back toward the largest gear to loadtest a storage platform or two. For my normal needs, the i3 is going to be enough… 64gb mSATA and a 4gb or 8gb bootable USB drive with networked storage. Hmm, then I’m gonna get an i3 version. I’m bored with configurations that doesn’t fit and won’t take a risk on this one. Just wondering how your going with using the NUC for your ESXi lab. Does it work well or are there some shortcomings with the platform? I haven’t really put it through its paces that much, but I suspect the main shortcoming will be the network. You have a single gigabit Ethernet, and I haven’t heard any good words about using USB Ethernet with VMware. But considering my previous lab machines had the same limitation, I’m not too worried. I’m looking at some slightly beefier machines for some I/O performance testing, but in terms of general virtualization this should be a good platform. I’m hoping to get one of the i5 boxes to try out as well, for a bit more power and possibly higher memory cap.